Melting of ice shelves in West Antarctica speeds up and slows down in response to changes in deep ocean temperature, and is far more variable than previously thought, according to new research published this week in the journal Nature Geoscience. Scientists studying seawater temperatures in the Amundsen Sea – part of the West Antarctic Ice Sheet (WAIS) – found a cycle of warming and cooling in the ocean over the 16 years of their observations. They show for the first time that while mass loss from the ice sheet increased during a warm period, it steadied and in some cases decreased during cooler phases. The authors also show evidence for linking this cycle to El Nino in the tropical Pacific Ocean. These findings are important for enabling better predictions about how much glacial melt will contribute to global sea-level rise. 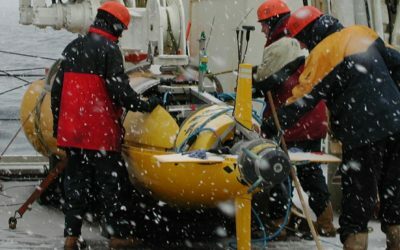 During eight Antarctic summers from 2000-2016 an international team of scientists from the UK, US and South Korea, observed changes in ocean temperature, salinity and currents near the Dotson Ice Shelf – an area of floating ice over three times the size of Greater London and seven times the size of New York City. Temperature fluctuations in the relatively warm (~0.5-1°C) Amundsen Sea cause far greater changes in melting than would occur along parts of the Antarctic coastline where deep ocean temperatures are lower (~-2°C). 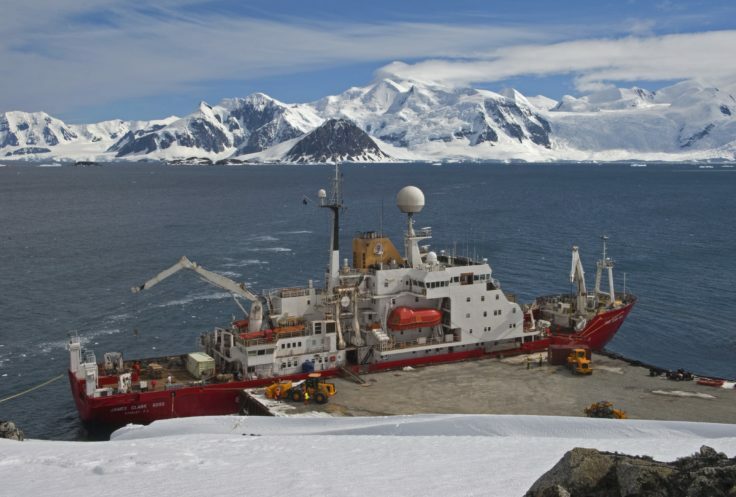 The research was carried out on board the RRS James Clark Ross, the Nathaniel B. Palmer and RV Araon. It is the first time a complete multi-year cycle of ocean temperature change and resulting changes in ice shelf melting have been documented in this region. The melt rate at the base of Dotson Ice Shelf was about the same in 2012-2016 as in 2000 (both cool periods), and much lower than between 2006-2009 (a warm period). In the recent cooler part of the cycle, the ice shelf mass increased, and the outflow from the ice sheet slowed, indicating that even on a timescale of a few years, the ice sheet can respond if deep ocean temperatures drop below or rise above the average. Although the authors have now demonstrated that ice shelf melting can vary widely in the short term, accounting for reported local changes in ice sheet outflow, a recent Nature paper reported that the overall trend in the WAIS is currently still one of ice loss. The research was carried out by an international team from British Antarctic Survey, Lamont-Doherty Earth Observatory of Columbia University, the Korea Polar Research Institute, the University of Inha (Korea) and the Institute of Arctic and Alpine Research at the University of Colorado. The work was supported by the UK Natural Environment Research Council, the US National Science Foundation and the Korea Polar Research Institute. West Antarctic Ice Sheet retreat in the Amundsen Sea driven by decadal oceanic variability by Adrian Jenkins, Deb Shoosmith, Pierre Dutrieux, Stan Jacobs, Tae Wan Kim, Sang Hoon Lee, Ho Kyung Ha and Sharon Stammerjohn is published in the journal Nature Geoscience here. Ice sheet – The Antarctic ice sheet is the largest single mass of ice on Earth. The ice sits on bedrock and covers an area of almost 14 million km2 and contains 30 million km3 of ice. Around 90% of the Earth’s ice mass is in Antarctica. If the West Antarctic Ice Sheet were to melt completely global sea-level rise would increase by around six metres. Ice shelf – An ice shelf is a thick floating platform of ice that forms where a glacier or ice sheet flows down to a coastline and onto the ocean surface.